If you were to ask me “What is the single most important Lean tool or method,” my answer would immediately be “genba kaizen” – with the understanding that no employee loses their job as a result of kaizen; i.e. “Respect for People” is operational in this and in many other ways. For the last 20 years or more, people have thought it wise to take apart kaizen and use the various tools and methods independently of one another, as shown in the image at right. I call this “atomized kaizen.” This is an enormous mistake because people learn far less from atomized kaizen than they can learn from genba kaizen. 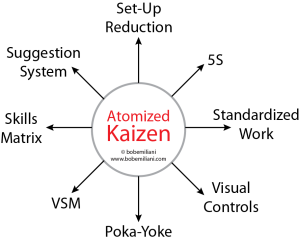 And the business result from atomized kaizen is next to nothing. Process improvement tools and methods used in isolation do not have the same impact that genba kaizen has. And, only genba kaizen can re-wire your brain from the current state (batch-and-queue way of thinking) to the future state (flow way of thinking). The great majority of authors of influential Lean books never got their hands dirty on the shop floor. They do not understand genba kaizen or its significance, and therefore paid little attention to it in their writings and speeches. As a result, many Lean practitioners today think they are doing kaizen when, in fact, they are not. And, they are certainly not achieving the individual development, organizational capability-building, and business results that comes with classic industrial engineering-based kaizen genba kaizen. The one method that leaders of the Lean community should have emphasized the most, genba kaizen, is what they emphasized the least. The result is widespread Fake Lean and failed Lean transformations. However, it is not too late to re-connect with genba kaizen and make the kind of progress that you had hoped to make. Great way to articulate the problem we have with fake lean transformations. I like the touching upon why it happens and then how to improve. The results will be the outcome. Systems Thinking in applying Lean. Do leaders understand this? Do leaders having understood this practice this? Those who have power do not empower the doer, and the doer will be keep on asking to do. As Deming put it, leaders will always exhort the lean leaders.